All those dumb questions you have about solo female travel? We asked 'em. I'll be the first to admit it — I don't travel solo, really, at, like, all. I've moved to strange places (which is totally different), I've spent maybe a day or two of a trip alone, but never the entire thing. I have all these questions in my head that seem kinda dumb...and I can't be the only one. So I asked one of my favorite freelance writers and solo female travelers, Paige Ashley Smith, her thoughts (since she's way better at this kind of thing than I am and I knew she wouldn't laugh at me). She did a killer job quelling my woes, and between this and knowing that "solo females" are becoming one of the largest demographics out there, well...I have no excuse. And now nor do you. 1) ...So, like...it's gotta be super lonely, right? It's actually not! Traveling alone means you're generally more approachable, so it's easy to strike up conversations with people in restaurants, cafés, bars, waiting in line for museum tickets, or whatever. You can join group tours, stay in hostels, or accept dinner invitations from your eighty-year-old Airbnb host that you wouldn't otherwise accept if you were traveling with your boyfriend, for example. 2) Huh. But how about scary? Nah, not really. Maybe the first time you're darting through a foreign train station on your own and trying to print out your ticket with 2 minutes to spare you'll feel a little panic, but you'll get used to relying on yourself. Being by yourself isn't inherently scary — it's the stuff we attach to it that makes it seem like a bad idea. I'll be all alone if something bad happens. No one is there to help me. I won't be able to split dessert with anyone. But you won't be alone and helpless — you'll be surrounded by kind strangers who will be more than willing lend you a hand if you ask politely. And as for the dessert? You can eat it all by yourself, I promise. 3) Solid point. I can definitely eat it all by myself. Okay, one more — isn't it expensive? It depends on how you travel and whether or not you're into the sharing economy (Uber Pool, hostels, etc.). Sure, if you want a whole Airbnb apartment to yourself and you can't share the cost with a friend, your budget will take a hit, but if that's a luxury you're willing to splurge on, you probably won't care. Interestingly enough, I find we generally spend more on things we don't necessarily care about when we're with people we do care about. You might not want to spend money on a drink, for example, but if you get dragged out to a bar by your crew, you'll probably feel obligated to shell out 14 Euros on a sugary caipirinha just so you have something to hold in your hand. Or maybe your girlfriend wants to take a day trip complete with a fancy lunch and expensive boat ride. It's not your first choice, but you spend the money on it because you're traveling together. You compromise your budget to accommodate things other people want. Traveling alone means you have the freedom to spend money on exactly what you want when you want. It can be as expensive or thrifty as you make it. 4) What has it taught you? What were you wrong about? Traveling solo has taught me that we're all so much more independent, self-reliant, and intuitive than we give ourselves credit for. We have literally evolved to learn how to survive, but we rarely get to use those biological instincts and skills. When you're traveling alone, though, you get the opportunity to discover how resourceful, sharp, and badass you really are. It's also taught me that most people in this big, wide world are good and warm-hearted and easy to relate to. I'm not naive, but I also don't want to enter every situation expecting the worst. I tend to travel believing that beautiful things will come my way, but also being prepared to work a little to get them. I'm thankful that traveling alone has so far been a really wonderful, organic experience, one that has allowed me to connect with so many new, interesting people and take advantage of the kindness random strangers have shown me. 5) Favorite solo memory. Go. 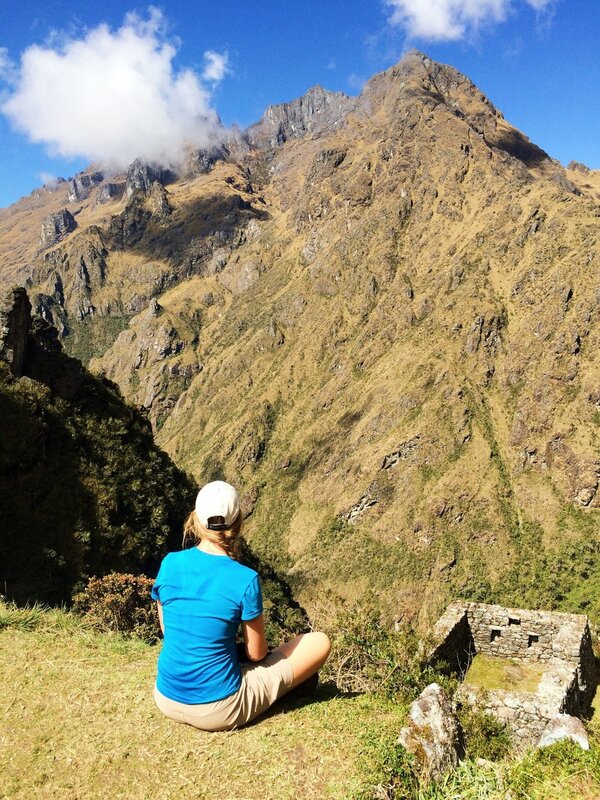 Hiking the Inca trail to Machu Picchu. I was there with a tour group, but my pace was a little faster than the rest of the group so I walked alone most of the way. There were all these beautiful viewpoints where there was no sound except the faintest rustle of wind in the leaves. I've never felt so liberated, empowered, and at peace than I did staring at those majestic mountains with no one around me for miles. I kept thinking to myself, "This is why I'm here. This feeling is why I did this." 6) In some ways it's gotta be better/easier, though. Hopefully? Totally. When you travel by yourself, you decide what you want to do, when you want to do it, and how you want to do it. If you want to sit in a park and eat a hunk of brie cheese in lieu of dinner, you can. If you want to book a spontaneous cooking class, you can. If you want to cancel your last four days in Rome and head straight to the Italian Riviera instead, you can. That's a gift and a level of freedom that's hard to re-create in regular life with family/friend commitments, work obligations, errands, and so on. When you're solo, you're totally removed from everything you're conditioned to believe you're supposed to do — and that's a beautiful experience. 7) Is there a good "baby step" for someone who hasn't done it? Do a weekend trip somewhere domestic. Maybe a nearby town or beachside escape you've always been meaning to visit, but never made happen. And even though you'll probably want to be money-conscious, pad your budget so you can spend a little extra making it the most comfortable, indulgent experience possible. I find it's easier to enjoy being alone when you treat yourself a little. After all, no traveler has ever relished the freedom of being alone while squished in an eight-person hostel dorm room with a bunkmate who snores (misery loves company, y'all). 8) Gotta ask...do you purposefully desexualize yourself when alone? Go different (read: safer) places? How does your behavior/presentation to the world change, if at all? I don't purposefully desexualize myself, but I also haven't yet traveled to places that have a reputation for harassing women. I do think about my safety a lot, though. I read up on travel warnings, do research on the areas I plan to visit, spend extra money to use cabs versus walking at night, and make a concerted effort to do only things I know I can get out of easily if I feel uncomfortable. I also try to sit near or walk near families and other young women my age if I'm feeling nervous in a sketchy part of town. I stay pretty true to who I am when I travel (I love chatting and am naturally very curious and inquisitive), but sometimes I will actively deflect conversation and become quieter around people I don't want to engage with. As a woman, I also have to put up a wall when I'm around a man or group of men who make me feel uneasy, but I do this whether or not I'm traveling. 9) Do you think everyone can enjoy it or does it require a specific type of individual? I do think everyone can enjoy it, though maybe not for the same amount of time. Someone who requires constant social stimulation might only love it for a few days, while an introvert could go for much longer. It depends on who you are and what you do to recharge your batteries. I will say this, though — people who love to read can travel alone for infinite amounts of time. That's because a book can be your best friend, main source of entertainment, and familiar comfort on the road. I don't know about you, but this is 100% convincing to me. I told you she's a killer woe-queller! Thanks, Paige. And if you need any of your woes quelled, hit up Paige yourself. She doesn't bite, I promise.